Your family or small group will enjoy this Scandinavian-Style vacation home on Lake Superior. Asle Ta is a true gem located on Cascade Beach Road, sitting just feet away from Lake Superior. Enjoy this 3 bedroom, 2 bathroom home during your next North Shore getaway. 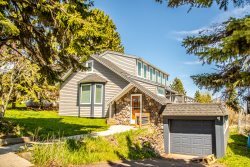 The home sits on 200 feet of private Lake Superior ledgerock shoreline. The cute, Scandinavian design creates a charming escape. The living room features comfortable furniture and a television with satellite, DVD and VHS players. Sit back and enjoy a movie after a long day of exploring the North Shore. The kitchen is off of the living room, boasting a semi-open living area, perfect for family gatherings. Enjoy a full sized electric stove and dishwasher to help prepare and clean-up your home cooked meals. Off of the kitchen you will find a dining room and sitting area with a gas fireplace. Spectacular window views make this a great room to dine or just hang out in. There is seating for everyone around the dining room table. The views are incredible from the master bedroom, also featuring a king sized bed and private bathroom. There is also a sitting area off the master bedroom that leads either into the bedroom or into the master bathroom and laundry area. The laundry area, located off the master bathroom, is available for guest usage. The master bathroom features a 2-person jetted tub and walk-in stone tile shower. Plenty of vanity space for getting ready in the morning. The beautiful stone tile surround walk-in shower. The upper level guest bedroom features a full and twin bed. The lower level guest bedroom has a queen sized bed. The large windows make the lower level guest bedroom bright and cheery. The guest bathroom, located on the lower level, has a shower/tub combo. Welcome to Asle Ta, your home away from home on Lake Superior`s North Shore. Head down the flight of stairs to access this quaint Scandinavian style retreat. Around the lake-facing side of the home you will find a spacious deck. The deck is larger on the sides of the home and expands out even more on the other end. On a warm summer`s day you can enjoy a meal with your family on the home`s lake-facing deck. These are the incredible views that can be enjoyed from the deck or from the dining room/living room area. Enjoy cooking a meal on the charcoal grill and then walk down to the shoreline- careful on the stairs leading to the shoreline- there are no handrails. The private section of Lake Superior shoreline is just steps away. These incredible views cannot be beat. Looking east at the home from the private ledgerock shoreline. These are the views you can enjoy on your stroll down to the ledgerock shoreline. Looking west down the shoreline- not another home in sight. Asle Ta is a beautiful vacation home on Lake Superior in Lutsen, MN. Pronounced "Azla Toe" this Scandinavian-inspired Lutsen vacation home is truly a gem. The cozy vacation home will be love at first sight when you experience the waves lapping at the shore, just steps from the decks of this stunning 3 bed, 2 bath home. Enjoy the spacious master bedroom with large lake-facing windows where you can see nothing but water as you gaze out from your bed. The master bathroom features a 2-person jetted tub and stone tiled walk-in shower. The guest bedrooms are comfortably appointed and feature a full and twin bed in the upper-level guest bedroom and a queen bed in the lower-level guest bedroom. The layout of this home makes it great for families and groups of friends traveling together. If you've come to the North Shore to relax, worry not! Asle Ta is a peaceful retreat that will instantly feel like your home away from home. Curl up with a book on the lake facing deck or grill a delicious meal on the charcoal grill. Sit on the private ledge rock shoreline and listen to the waves lap against the rocks, enjoy the early morning sunrise or look for shooting stars in the darkness of the night. The location of the home was great. It was clean and in very good condition. We enjoyed the privacy yet the ability to get to places of interest in a short time. The lake views were stunning! The master bedroom shower was amazing! This home provided us with one of the most relaxing trips we have ever taken! Love this! We thoroughly enjoyed every part of our stay at the Asla Ta rental. The house was perfect for our size group and the layout of the house was wonderful. Being right on the lake with the large windows on the main floor and from the master bedroom was beautiful. The house was accommodating and welcoming in every way. We prepared our own meal the first evening and had close enough locations to go out to for Saturday evening. Highly recommend the rental and would love to go back this summer. Great views of Lake Superior. Awesome master bedroom on upper level with nice bath including a walk-in shower and jetted tub. Beautiful setting on the lake. Peaceful and quiet. Nicely furnished kitchen. Loved the property! Absolutely beautiful. I can see where the stairs down from the parking area might trouble elderly or people who have trouble walking. Plenty of kitchen utensils, pots and pans. I could have stayed in the master bath the entire week!